Moist to moderately moist. 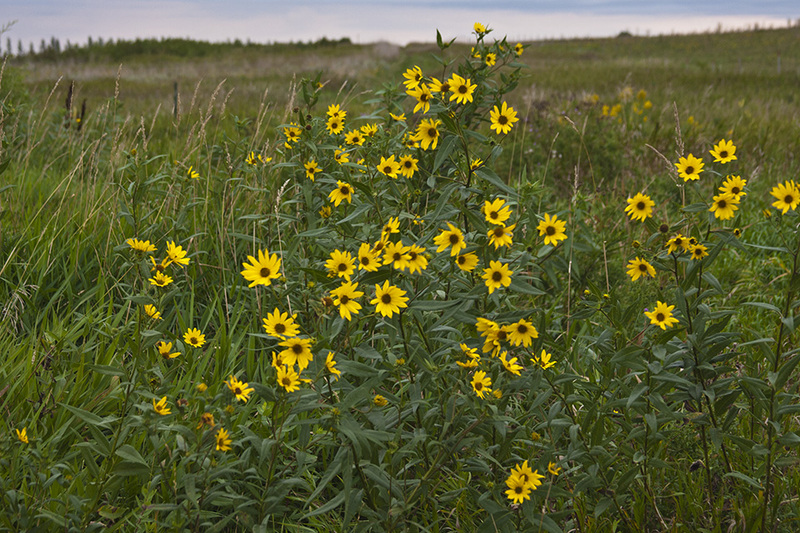 Prairies, wetland margins. Full sun. This is an erect perennial forb that rises on one or a few stems from a short, branched rhizome. It can be from 40″ to 100″ tall, though in Minnesota it is usually no more than 80″ in height. The stems are erect, usually yellowish-brown or green, and sometimes covered with a whitish, waxy bloom (glaucous). They are sometimes branched near the top. Below the inflorescence they are usually hairless though they sometimes are sparsely covered with short, stiff hairs. There are no basal leaves. 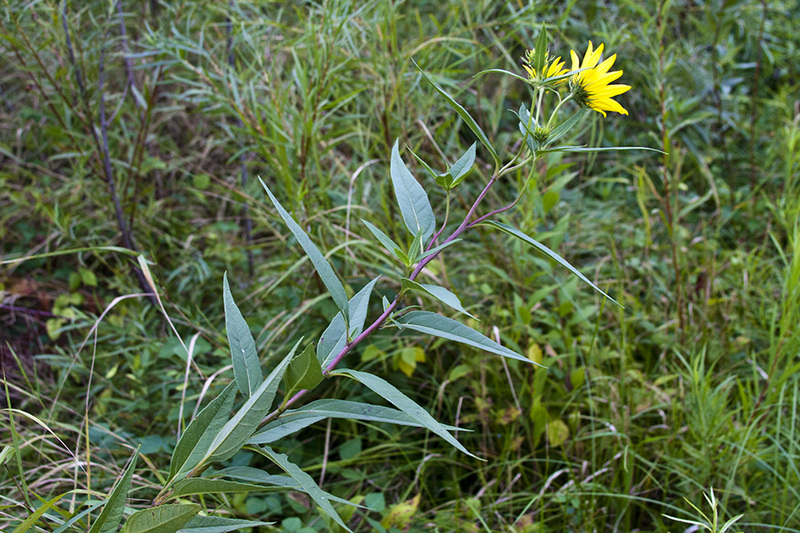 Lower and middle stem leaves are opposite, those near the top are alternate. They are on 3 ⁄16″ to ⅝″ long leaf stalks. The leaf blades are lance-shaped to nearly egg-shaped and flat, not folded longitudinally. They are 1½″ to 8″ long and 5 ⁄16″ to 1½″ wide. They are wedge-shaped at the base and taper to a point at the tip with straight sides along the tip. The upper surface is green and rough to the touch due to the presence if short, stiff hairs. The lower surface is covered with short or minute stiff hairs. The margins are untoothed or sparingly, shallowly toothed. The leaves have 3 main veins, a midvein and a pair of lateral veins that branch off the main vein above the base and arch upward. The inflorescence is a solitary head or an open, branched cluster of 2 to 6 flower heads at the end of the stem. The flower heads are on stout, ⅜″ to 7″ long stalks. The whorl of 30 to 38 bracts at the base of the flower head (involucre) is hemispheric in shape and ⅜″ to ¾″ in diameter. The bracts of the involucre are loose, spreading, almost hairless, lance-shaped to lance egg-shaped, and taper to a sharply-pointed tip. 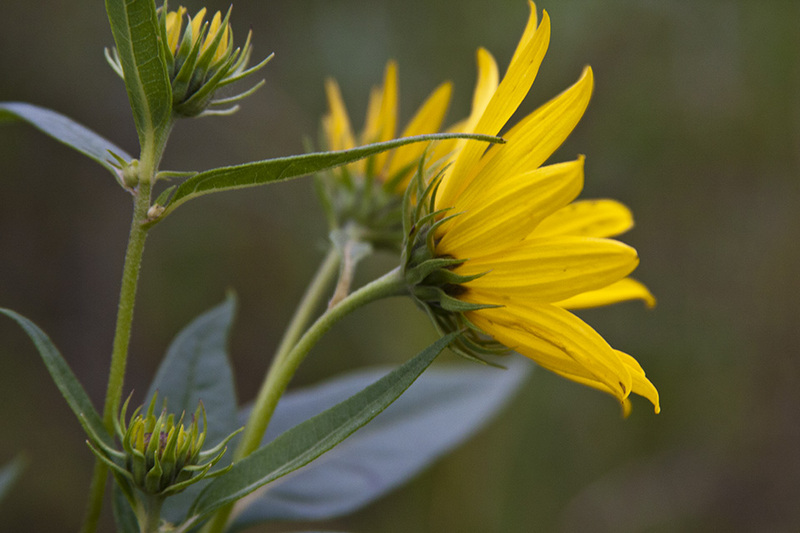 The flower heads are 3″ to 3½″ wide with a ⅝″ to ¾″ wide disk. There are 10 to 21 yellow ray florets and 60 or more yellow disk florets. 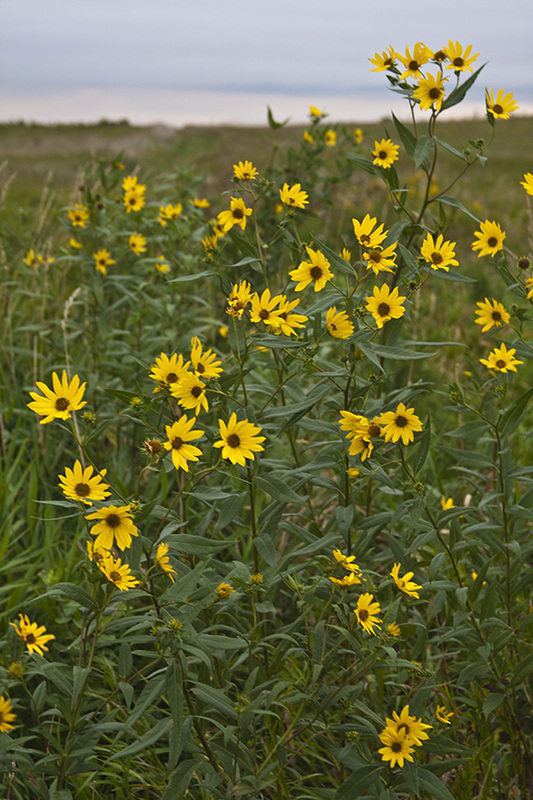 See the Sunflowers ID Filter for a spreadsheet to aid identification of this and similar species. 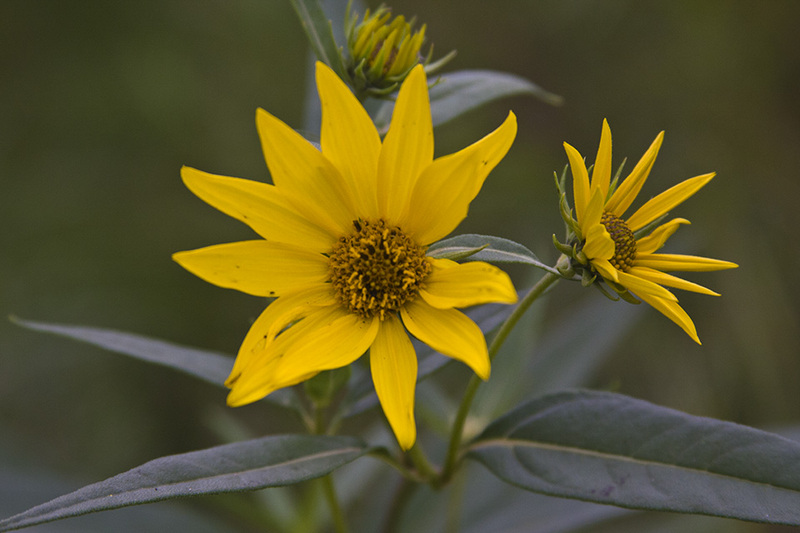 Sawtooth sunflower (Helianthus grosseserratus) leaves are on longer stalks, ¾″ to 2″ long. The leaf blades are larger, 4″ to 12½″ long, and 1½″ to 3½″ wide. The margins are always toothed. The inflorescence has up to 15 flower heads. The involucre has 25 to 30 bracts. The flower head has 100 or more disk florets. Sources:3, 4, 5, 7, 28. The map at the left includes all historical records. The only known current population in Minnesota, aside from the one sighting listed below, is in Foxhome Prairie, in Wilkin County. There may also be a population in Buffalo River State Park, where it was recorded in 1962. It is likely that other populations exist in other western counties.